Le Manlie Loft is a spectacular blend of Historic & Modern! This 1150 square foot Loft apartment, in a building dating back to the 1700's, was lovingly renovated, and creatively furnished by a well respected Architect/Interior Designer, responsible for several amazing renovations of historic chateaux, hotels and restaurants in and around Amboise itself. She's known for her beautiful balance of original features, such as exposed stone walls, oak beams, mixed with whimsical modern furnishings, and all the modern conveniences-- like Air-Conditioning, WiFi, Large TV with Cable. Le Manlie Loft, with it's 20 foot cathedral ceilings and historic oak beams, is up 2 flights of stairs. There are 2 full bedrooms, one with a Queen bed, the other with 2 singles (can be put together as a King, if necessary), and there's also a convertible sofa bed in the living area that transforms into a double. The kitchen is fully equipped with induction cook top, multi-function oven: microwave, steamer and oven. There's a dishwasher, and clothes washer that also drys. The bright bathroom has a walk in shower, heated towel rack and sink with storage underneath. The WC is separate, which means no waiting! The Loft is at the corner of the Rue Nationale, the main artery of Amboise's Old Town, lined with shops, food specialty stores (like the Rimboux cheese shop just downstairs! ), restaurants, wine shops and cafés. The well equipped, and very friendly Tourist Office is a straight walk from the building's entrance (2 minutes). The Place du Chateau, and main entrance to the Royal Palace, is down the Rue Nationale, after passing under the quaint clock tower. The Open Market along the Loire is just past the Tourist Office. 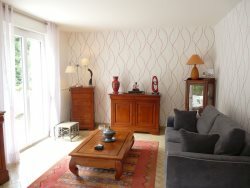 Then, return to Le Manlie Loft, your Amboise chez-vous, to prepare memorable meals. Rue Nationale, or the amazing island, Île d'Or, off the Amboise bridge in the middle of the Loire River.